Sail to the island but watch out for Cyclos and make sure you mark the islands along the way or you'll get totally lost. The shortest way is going northwest to two islands apart then west two islands apart. 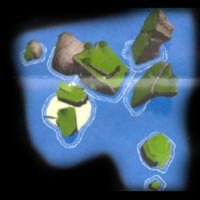 Once you reach your destination island, it's reveal that Ganon has destroyed the island, leaving a black cloud circling the island. Quill appears and tells Link that Jabun that lived here has escaped to Outset Island which is blocked by a slab of rocks which requires bombs to use. Quill also reveals that Tetra's ship couldn't get through the big door to get to where Jabun is. This page was last edited on 1 June 2010, at 19:41.